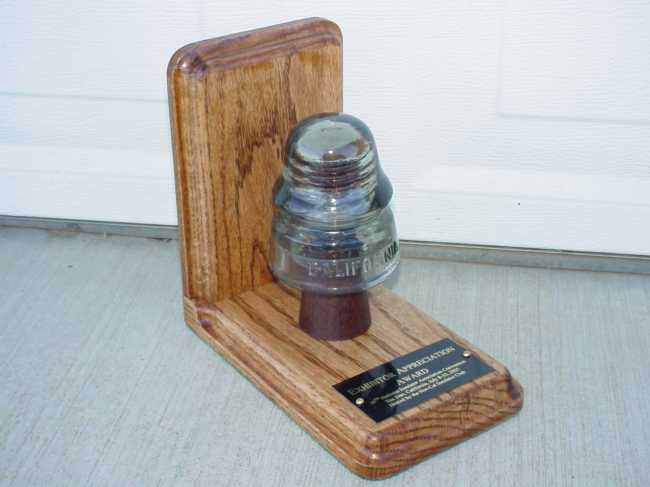 This is one of the awards given to each of the displayers. It's a nice bookend and they had different CD's of California glass. Wish I knew who made them? Thank-you. The best thing was all the displayers were awarded. I had a couple of blue 162's and a 161 with milk in the Cal combined. My 160 yellow made the display also. What fun it was to show them off, the milky ones I picked off poles about two years ago. Lucky the older collectors missed them. My intention was to join in with the flow, and be a small part of this show. When I was given this, it was unexpected but greatly appreciated. The glass God's were shining on me it's even my favorite CD 160.